Several papers carried pieces over the weekend about an EU ruling putting small garages out of business, because they won’t be able to get information about cars from the major manufacturers. This is all about something called the “block exemption” which has allowed agreements to have been made between car companies and independent garages. There are concerns that if this exemption is removed, smaller companies will no longer get this information. But we need to look at the big picture. Alongside the block exemption (which basically means that if companies work together they won’t get accused of operating a cartel), we also see that the Commission has actively required car manufacturers to provide information about how their cars work outside their own distribution network. To the extent of taking car manufacturers to court. These measures are much more forceful and enforceable than the block exemption and so will give a solid basis to the means by which independent garages can continue to operate. So Kevin the mechanic from Coronation Street (the example given by the Daily Express as a mechanic that will go out of business…could someone please tell them that it’s NOT REAL!!!) will still be able to ply his trade and in fact there will be much tougher enforcement if the car manufacturers try to stop him. Had a lovely time at the weekend, manning a stall at the Thames Festival, within the New Europe Village, which was showcasing the new Memebr States. 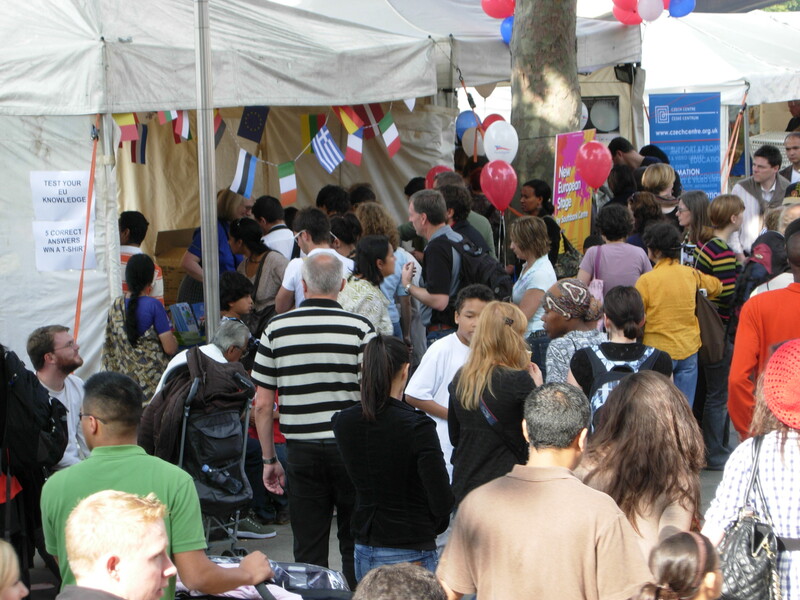 We handed out publications and people could take a quiz to test their EU knowledge. Even when all the freebies had gone (I’m not *totally* naive about these things) we had a lot of people picking up publications: several mums keen to support their child’s language learning; a woman who said to her boyfriend “we have to take this, it’s really interesting”; loads of people who sidled up and snuck a few brochures away as if they were going to get caught and an alarm would go off: “Whoop whoop, possible Europhile alert”. Very encouraging really, at the heart of what is supposedly the most Eurosceptic country.